From 2-5 October 2014 Osijek successfully held the sixth Congress of the Croatian Society of Radiology, organised by the Croatian Society of radiology of the Croatian medical association and led by its president, Prof. Ph.D. Damir Miletić, and Ph.d. Gordan Šarić, president of the congress organizing committee. Osijek, a city located in the heart of Slavonia, hosted a full 400 participants at the event and attracted an international participation, with ten percent being foreign guests. The technical organisation of the event was entrusted to PCO and DMC company Globtour Event, which was their first collaboration with the Croatian Society of Radiology. The congress involved a significant working element at the Hotel Osijek, through a series of expert and specialist lectures in the field of radiology and the poster presentations that usually accompany such gatherings. Equally interesting was the social component of the event, organised in Ilok and the beautiful Principovac estate, where after visiting nearby Vukovar and Ovčara a gala dinner and entertainment for the participants was arranged. 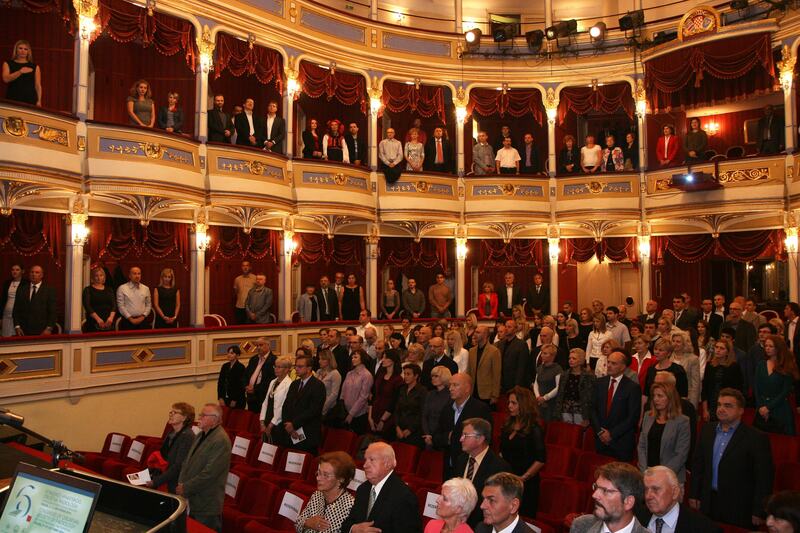 The congress was officially opened at the Croatian National Theatre in Osijek, with an excerpt of the play „Lipa si, Teno performed after the organisers’ welcome speeches and the invited lectures, the evening rounded off with a special reception in the National Theatre lobby. This congress is held every four years in University cities, whereby all four major University Cities in Croatia are equally represented and regions get to host eminent foreign and domestic experts, such as Prof. Lorenzo Bonomo, President of the European Society of Radiology. The congress enables easier participation for doctors from nearby hospitals and medical centres as well as enhanced learning about the situation and development of radiology at home and around the world. The congress programme covered all areas of radiology, as well as protection against ionizing radiation. The range of sponsors drawn to the event were companies directly related to the field and the theme of the congress, such as Siemens, Bracco, Mark Medical, Bayer and a number of others. In keeping with its purpose, sponsors only financed the working part of the events, while participants independently financed excursions and entertainment. The organisers were also extremely satisfied with the location of the congress. Despite Osijek having no convention centre and only being able to accommodate small and medium-sized gatherings, it is becoming a popular destination for congresses and symposia, especially medical. In addition to the city, which lies on the river Drava, the surrounding area also offers a range options for tours and teambuilding events and the wider region is also known for its culinary delights and the cordiality of its inhabitants. “According to the feedback, the greatest satisfaction stemmed precisely from the human relationships, the professional approach from our organization team and the team from Hotel Osijek, which has done a superb job and can serve as an example to many hotel companies in Croatia dealing with congress tourism,” said Vesna Pritchard. The 75th Edition Of Kongres Magazine Is Focused On Those Who Dare! Slovenian Edition of Kongres Magazine is live! Remember the times we had in 2018?